Yogesh, a district leader of Bajrang Dal is currently in police custody. He was arrested at around 11: 30 PM on January 3 from the Khurja T-point on National Highway 91. 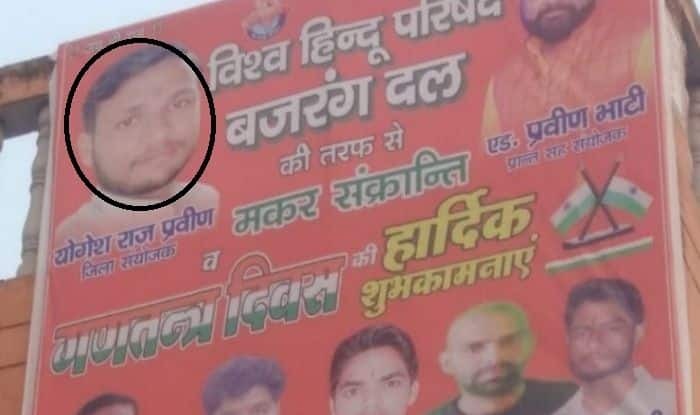 New Delhi: Yogesh Raj, the main accused in Bulandshahr violence in which a police officer was killed, featured in posters of the Bajrang Dal, a Hindu right-wing group to greet people on Makar Sankranti festival and Republic Day. The posters also have pictures of Satish Lodhi, Ashish Chauhan, Satendra Rajput and Vishal Tyagi, all accused in the case. Defending the move, the Bajrang Dal has claimed that they are innocent and will be cleared of the allegations. “They all are accused in the case, not guilty. It is for the court to decide. Putting pictures of organisation’s office bearers on hoardings is not a crime,”Bajrang Dal’s Assistant Regional Convenor Praveen Bhati said. He also re-iterated that the Bajrang Dal stands in support of its office-bearers accused in the case and is providing them with all legal aid. Before his arrest, he had released a video claiming innocence. “There were two incidents that happened on that day. The first incident was related to cow slaughter at Mahav village near Siyana. When I got information about that, I reached there with my supporters. The police also reached there and we went to the Siana police station for filing our complaint (about cow slaughter). when we were still at the police station we got to know that villagers were pelting stones. There had been firing as well and a youth and a policeman have received gunshot injuries,” the Bajrang Dal leader had said. “When police were writing complaint as we had asked for, why would Bajrang Dal protest? I was not present at the location of the second incident. I have nothing to do with it. I have full faith in the God. I will be cleared of all accusations,” he had claimed. Bajrang Dal’s national spokesperson Surendra Jain too had denied involvement of its functionary in the killings and later went on to claim that the incident took place due to the anger of the people. Last year on December 3, Police Inspector Subodh Kumar Singh, who had initially probed the 2015 lynching of Mohammed Akhlaq, and a civilian Sumit Kumar, 20, were killed of bullet shots during a mob violence, that erupted after cattle carcasses were found strewn outside nearby Mahaw village of Bulandshahr district.